▶2.COMFORTABLE TO WEAR: Non-allergic to skin. The extra holes allow for better band breathing, not as sweaty when working out. 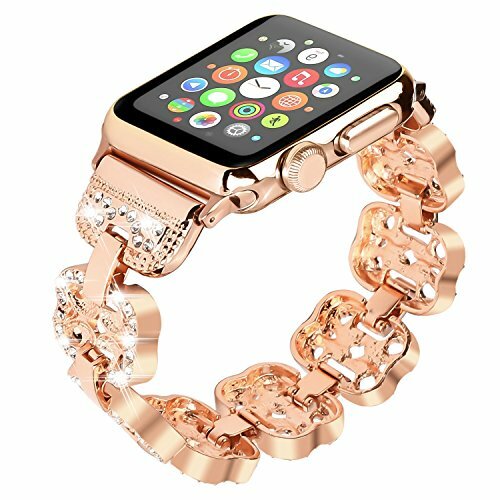 ▶3.FASHIONABLE: Stylish and attractive crystal rhinestones design makes this band look fantastic with your apple watch, giving a nice professional look on any occasion. ▶4.IDEAL GIFT: It is a decent gift for Valentine\'s Day, Birthday, Anniversary, Graduation, Mother\'s Day, Wedding, Thanksgiving, Christmas, New Year, etc. ▶5.WIDE COMPATIBILITY: Compatible with all versions: apple watch series 4, apple watch series 3, apple watch series 2, apple watch series 1, apple watch sport, apple watch nike+, apple watch hermes, apple watch edition.